The Indus River Dolphin has a long beak and a stocky body. It has a low triangular hump on its back in place of a 'true' dorsal fin. It is gray-brown in color, sometimes with a pinkish belly. The eyes are extremely small, resembling pinhole openings slightly above the mouth. The Indus River dolphin measures between 1.5 - 2.5 m (5 - 8') in length and weighs 80 - 90 kg (180 - 200 lb). The Indus River dolphin generally occurs in the deepest river channel and is less common in secondary channels and small braids. Reported habitat preferences include channel constrictions, confluences, and deep, low-velocity water. The Indus River dolphin feeds mostly on several species of fish and invertebrates. It does much of its feeding at or near the bottom, using echolocation, swimming on one side, and probing the river bottom with its snout and its flipper. Although it is not usually considered to be gregarious, relatively high densities are found at sites where rivers join, in areas where the current is relatively weak, off the mouths of irrigation canals, and near villages and ferry routes. The main reason for the decline of the Indus River dolphin was the construction of numerous dams and barrages, starting in the 1930's, that have fragmented the population and reduced the amount of available habitat. Another severe threat to the survival of the Indus River Dolphin is probably the increasing withdrawal of water. Dolphins no longer occur in the lower reaches of the Indus because upstream water extraction leaves downstream channels virtually dry for several months each year. 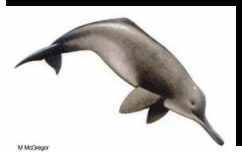 *** The Indus River dolphin is one of the world's rarest mammals. *** Although its eye lacks a lens, and it is sometimes referred to as being blind, the Indus River dolphin's eye does seem to function as a direction-finding device by using the direction and intensity of light. 2006: Occurs in the Indus River system in Pakistan (IUCN 2006). The Indus River dolphin measures between 1.5 - 2.5 m (5 - 8') in length and weighs 80 - 90 kg (180 - 200 lb). Likely 6 - 10 years (IUCN 2006) . The calving interval is 2 years. Calves may be weaned by the time they are 1 year old. May be close to 30 (IUCN 2006) . The Indus River dolphin comes to the surface to breathe about every 30 - 120 seconds. 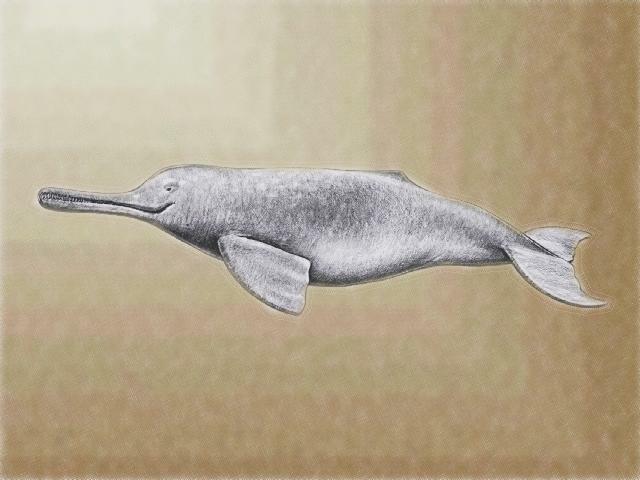 When the Indus was a free-flowing river, the Indus River dolphin would migrate upstream into the smaller tributaries during the monsoon rains and migrate downstream to the main channels in the dry season. A male:female ratio of 2:1 has been reported. Bonner 1989, Burton & Pearson 1987, Cetacea, Culik 2003c, IUCN 1994, IUCN 1996, IUCN 2000, IUCN 2002, IUCN 2003a, IUCN 2006, IWC 2000, Klinowska 1991, Macdonald 1984, Nowak & Paradiso 1983, Nowak 1999, Olson & Dinerstein 1998, Olson & Dinerstein 1999, Reeves & Chaudhry 1998, Reeves et al. 2000, Reeves et al. 2003, Reeves 2004, Swiss Cet. Soc.